I was anxiously awaiting this album as it has been a while since Paulie has put out an album and I was getting a bit testy. The first look through the album musos and producer and the quick notes about the songwriters on the back of the cover and I thought, gees, Paulie, at least you could have got the cream of Australian Country Music to help you out on this album after all of the years that you have put in, instead of this shabby lot….joke. Wow, what a line up…..I don’t think that the Oscars had a line up like this. When I saw Sir Allan’s name, I thought that I would listen to the album before I looked at who wrote what with Paul. I picked the Caswell track….I am getting good at this. I picked the Drew tracks. Matt’s were harder to pick because he mixes it up a lot and he is getting rockier as he matures. It is a little game that I play now, most of the time, I get it right. I have loved Paulie for a long time, big time. As most people know, I do love a ballad or a slower track best, but when Paulie rocks it out, he still does it with a country twang. He even includes the classic 60’s rock song “The Letter” in the mix, just to test us out. You would think that it was a country song when you hear Paul sing it. This album definitely has a different sound to it though….I guess with the mixture of influences in the band and in production, it would have to change. It is very slick. It is wonderful to hear the voice of one of my favourite singers on here too, Chris E Thomas. Lots of my country music heroes are on this album, including Shane Nicholson and Matt Scullion and the man himself. No two songs are the same, he gives us a bit of everything. Matt Fell plays everything bar the chopsticks as well as commanding the ship. He is certainly turning into a legend in Australian music. Paul is one of the nice guys of country music and he never disappoints. With his rich vocals and his easy and down to earth approach to everything he does makes him present to us another winner. Today – The print is so small on the album that even with my glasses on, I can’t read the songwriters. However, this is a terrific song and a good way to open an album. Off the grid: (Paul Costa/Matt Scullion): a rocking, out of here, off the track song. Best version of me ( Paul Costa/Matt Scullion): The first one that I picked as a Matt Scullion co-write. I can hear him doing a version of it too, even though I suspect it is more a Paul Costa autobiographical number. A beaut song. 4.35 (Again, I can’t read the print) This is one of my favourites on the album. Most people would guess that it would be one of my favourites. Nice and easy, but earthy at the same time. 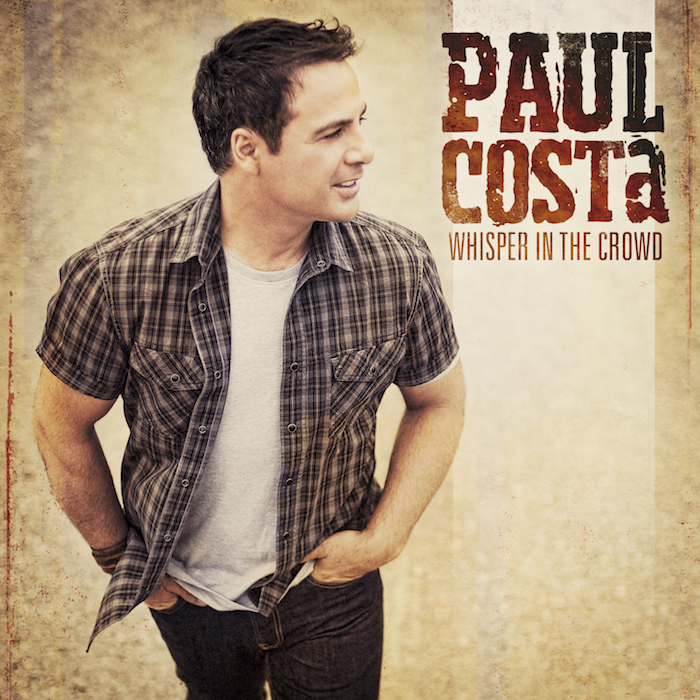 Whisper in the crowd ( Paul Costa/Drew McAlister) – Paul always features at least one think about this song and this has the Drew sound all over it. An anthem like powerful song. Charlie’s 28 (Paul Costa/Pete Denahy/Noel Costa) – Cool to see brother Noel as a co-writer on this song. This could get Paul a Golden Guitar nomination in January. It is very Australian. Devil can wait ( Paul Costa/Matt Scullion) – Lots of cool twangy bits in this one with some nice haunting bv’s by Chris E. A bluesy, wipe the dust off the boots song. The Letter ( Wayne Carson Thompson) – classic 60’s song turned into a country song. Great cover. Drive to heaven ( Paul Costa/Matt Scullion) – Paul usually puts a sentimental, tear jerking song on an album. This is the one. I can see this happening in Paul’s family. Chapter one ( Paul Costa/Allan Caswell) – Caswell is all over this. This is the kind of song that Paulie sings best and definitely my favourite on the album. Another winner, Sir Allan. Road train ( Paul Costa/Drew McAlister) – A good country rock song. Guitars and drums drive it home. A real head nodding, shoulder shifting, toe tapping son of a gun song. Gettin’ Bigger (Paul Costa/Matt Scullion) – Another favourite on the album. One that will go well on the radio. Possible shower song contender. There are a lot of musicians out there – particularly in country music – who fly under the radar. They are just as great as the ones who get all the headlines and the kudos, sometimes even greater, but they go through their careers and their lives without the recognition that they deserve. It is the job of us fans out there to make sure that these excellent talents get that recognition, or at least open up the ears and eyes of as many as we can to these guys and gals. Matt Cornell is one of this species. This album is quite splendiferous. The only fault with it is that it is too short! 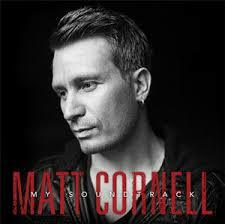 This is the third solo album by Matt, although he has also been part of Adam Brand’s Outlaws and he has featured on other people’s albums. The quality of his co-writers and his musicians on this album and a very prolific and fine producer in Matt Fell (who plays everything on this album bar the spoons), shows that he is well respected and that he commands the best. His fans have waited for this album for a while, we have been very excited as the day has drawn near. The album was well worth the wait. It’s Only Midnight (Alex Kline/Scott Stevens/Rob Crosby) – This is the only song on the album that Matt doesn’t co-write. It does have similar qualities to the other songs. You can easily see how it fits the brief. It has that ‘song for a long car drive’ feel to it. My Soundtrack (Matt Cornell/Allan Caswell/Drew McAlister) – Probably the best song on the album. It has Caswell and McAlister written all over it. Matt sometimes sings a little like Drew, and the words are classic Caswellisms. Definitely shower song material! See how many artists you can pick out of the song! What He Does (Matt Cornell/Allan Caswell/Adam Church) – A good country rocking song about a working class man. In This Town (Matt Cornell/Allan Caswell) – I think that we can all relate to the characters in this song, especially if you are from a small country town. A very hummable, toe tapping song. Un-Break My Heart (Matt Cornell/Allan Caswell) – A lovely song. Beautiful melody, great words, strong vocals….what else do you need? Rest of Our Lives (Matt Cornell/Damien Leith) – Fresh from the award winning co-write with Travis Collins (another one of those outlaws), Damien Leith has a hand in this song with Matt and it has a touch of the Celtic in it. A nice slow dance song. Jenny Packs Her Bags (Matt Cornell/Allan Caswell) – This song has a touch of the Bryan Adams about it, and even a bit of Joe Jackson. (Gees now I am reflecting on my soundtrack!) A real toe tapper. Matt’s vocals are at their peak and he has quite a range. A technically sound album with some great guitar driven tracks and some terrific ballads. The songs of this album will feature in many award ceremonies over the next 12 months and it will also get many plays on the radio. You won’t be disappointed if you give this album a spin or three. I think many of those who don’t know Matt’s work will be awoken and go out in search for more. Great stuff. Matt Fell – Bass, acoustic and electric guitars, ukelele, banjo, keyboards, drum and keyboard programming, percussion, backing vocals …..phew! Colin Coorie – Keys and piano on Un-break my heart. Darren Coggan is not only one of our finest country music artists, he is also an amazingly diverse entertainer. His War Stories album and stage show was one of the most amazing contributions that I have seen or heard in this country. He has starred as Richie Cunningham in a Happy Days theatre production and his Peace Train – Cat Stevens’ Show has toured the country and has become a sellout programme in Australia. He is now taking the show to the U.K. Add to all of that, his shows with Michael Fix and his show in Tamworth this year which attracted amazing reviews, then you have one hell of a package. He was narrowly pipped by Allan Caswell as Kazzie Awards’ Entertainer of the Year last year. If Allan hadn’t had such an all conquering year, then he would have taken the prize. This album is produced by Ben Edgar (guitarist for Missy Higgins, Goyte, Passenger, Angus and Julia Stone) and it was recorded in Melbourne. That move alone adds a little point of difference. This album is long awaited. It has been a while between albums and this album is as diverse as his career has been. 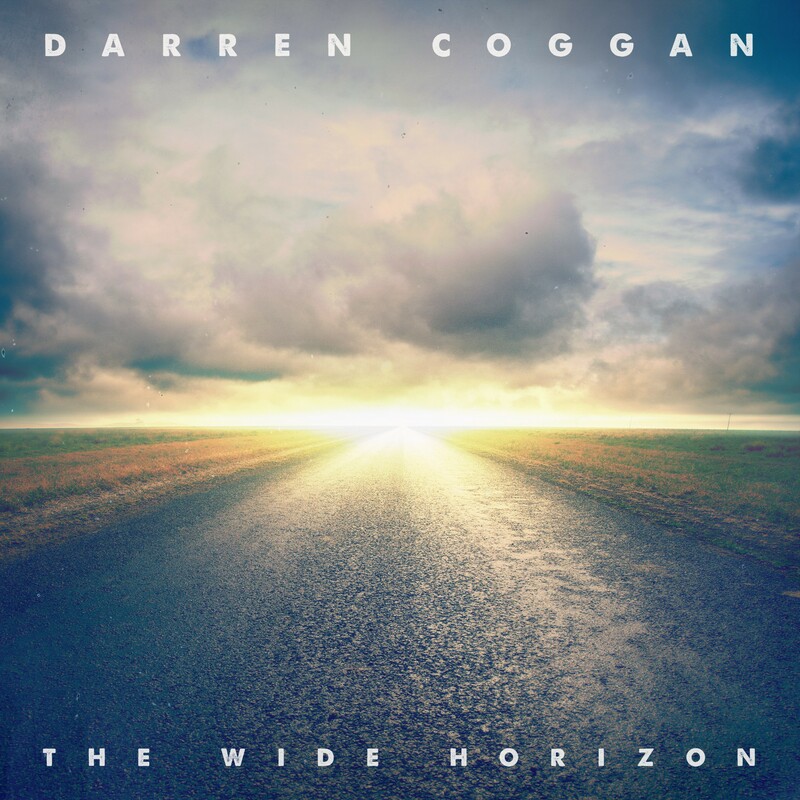 I don’t have all of the credits but it is safe to say that The Wide Horizon is mainly made up of Darren Coggan originals, apart from some obvious classics. Very few musicians in Australia can equal Darren’s strength in all of the areas of entertainment that he ventures into. This album is a polished, beautifully produced example of how several genres can come together to make a gem. The Wide Horizon: I love it when an artist opens with the title track of the album. It is the obvious choice too. A very positive, uplifting song. Scotland: A stirring song and an obvious link to Darren’s Celtic heritage. The ‘Bidgee: A very Australian song about the area where Darren grew up in. A Beautiful Ride: Darren’s song about his children. Lovely. Reckless: A beautiful version of one of the top ten classic Aussie songs. The haunting song by James Reyne must be handled with respect and Darren does that. Until We Meet Again: A tribute to absent friends, a moving, gentle song and one of my favourites on the album. Hughie: As in (send it down). A common dilemma amongst farmers and those in drought effected areas in general. A rockier number with a strong message. Seventeen: A tribute to “the bride”. A sweet love song. Tales Told by We Lesser Men (Ned Kelly): I have heard that this is based on a bush ballad by Ken McBeath. This is an incredibly moving piece and the strings are just awesome. Food for thought. The Best of All Possible Worlds: Michael Genner’s rollicking song is a toe tapper with some ‘every cloud has a silver lining’ moments. Clap along! Inasmuch (featuring Felicity Urquhart): Darren has a great way of echoing the thoughts of many Australians in his songs. He stirs the pot on issues and situations that we find ourselves in but not necessarily in ‘pie in the face’ way. He is much more subtle and he does it with respect and intelligence. This stirring song about Norfolk Island is enhanced by the presence of Felicity Urquhart, one of the busiest people in Australian Country Music and probably as diverse as Darren. Golden Guitar nomination, 2018…..you betcha. Darren Coggan never disappoints. His arms embrace a plethora of musical avenues but he never falls short of excellence. With his distinctive voice, insight, incredible messages and uniquely Australian perspective, this is another triumph. Click the link for a fun promo. In my dreams……you can make it a reality with your vote! Musos: Listen up, here are some great deals for you. Unusually, i’ve had a whole bunch of people approach me this year about whether i do ‘project recording packages’. More so than at any time in my career. I guess we’re all looking for a bargain. A lot of people are secretive about prices, but i stand by the value in what i do. I’m also aware that there are lots of great great producers and studios around, and that people should examine their options. I guess the point of the packages listed here is to give people a starting point, and some structure to start thinking about. I’m REALLY good at managing people’s budgets and expectations when it comes to record making. So of course, if you have an idea of what you want to do and it’s not listed here, let me know and we can customise it (and remember, videos, and graphic design and photography, or mixing and mastering are all things that I can do with, or separately, to recording). And lastly – just because it says ‘12 days recording’ doesn’t mean it has to be in one slog. You can do 12 days over 12 months if you like. I’ll always keep track of the work we do, and keep you informed of how we’re travelling. Remember – if you budget carefully and sensibly, and realistically, whether you work with me or anyone else, you’ll always be able to keep to it while having a great creative experience. Studio documentary type music videos, standard music videos, EPKs (electronic press kits), in session photos available for additional, negotiable fee. Artists must pay a 25% deposit to secure sessions and another 25% at least a day in advance of the first day of session. A further 25% will be paid halfway through booked time. The balance will be paid on completion. A further 5% discount will be offered for full payment up front. Most people who read my reviews know that I use a 3 play system before I look at other reviews (if there are any) to see if I am on target. I discovered a site that is called “Saving Country Music.com” and read a review of this album….and I thought, there is probably no point writing a review, I am never going to write one as good as this one. The reviewer wrote everything that I had in my head and heart and wrote it better than I ever could. Check it out if you get the chance, it describes Marty to a t. It is quite possibly the best review that I have ever read. I looked at several other reviews and they are almost as good as the above one, saying things that I was thinking, so at least I knew that I was on the right track. Maybe the reviews are so good this time around because the quality of this album is well…..beyond superlatives. Having said that, let me say this…..
Marty takes us on a journey through deserts, canyons, the Baja coast and if you could put a horse on a surfboard, then that would be there too. Named after Marty Robbins, the well loved country music legend puts us in a spaghetti western and through a tube in a 60’s surfing movie. Robbins could have been riding shotguitar with him on this one, along with the other country music ghost, Johnny Cash. The California sound mixes with a one horse town with tumbleweeds rolling down Main Street. 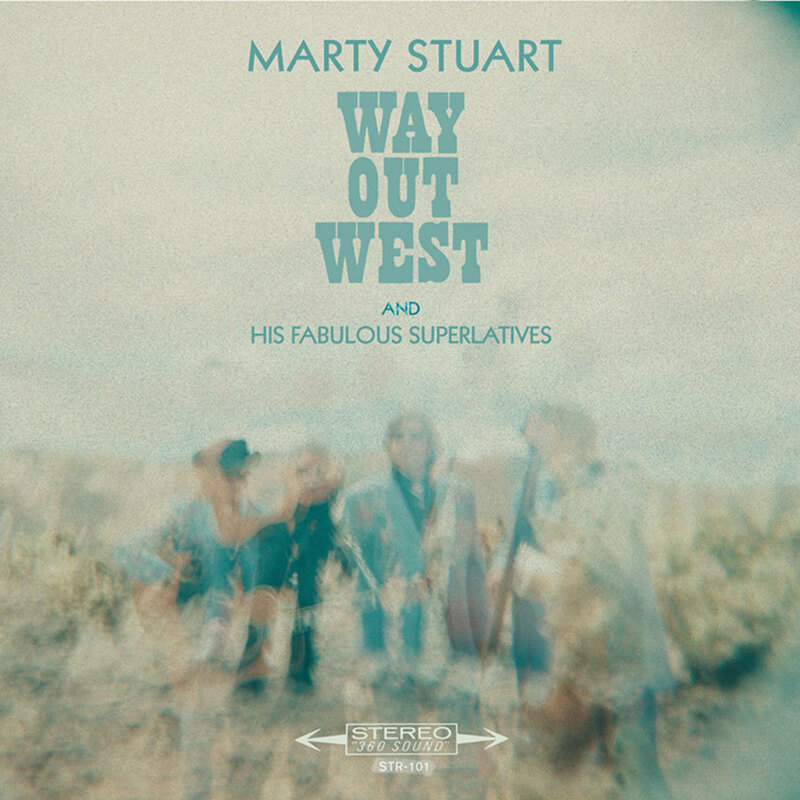 Marty Stuart, as other reviewers have pointed out, has enjoyed longevity by going against the grain of trends and turns in country music. He has stuck to what he loves and what he knows but at the same time, he has made the old seem new and he has gained a younger audience by that very rebellious streak that kids lap up. He has maintained a cult following and the respect of his older fans and critics by remaining true to traditions, albeit disguised and tinged with a handful of new flights of fancy. Like all great artists, he is chiefly a storyteller. This Mike Campbell (Tom Petty and the Heartbreakers) produced effort, is like a Western Movie, with every Marty Stuart move that you would expect and a few that you may not. There are a few instrumentals on this album, and even the songs with vocals are dominated by guitar driven periods and often that 60’s drum beat. Marty points out in one review that country instrumentals (old style) and 60’s surfing tunes are not that much different in style. In one song, Air Mail Special, the intro guitar licks are similar to an Elvis song or two of the 60’s, then it turns into more of a rockabilly style. Marty is not afraid to mix it up. Torpedo is very reminiscent of that 60’s surfer style. I can see the girls and guys on the California beaches slicing sand and the bleach blondes hangin’ 10 to this tune and others like it on the album. This album is very clever. It will be able to appeal to a wide audience for many different reasons. Marty has managed to combine the traditional country music styles with other elements of music. With the exception of the title track, the songs are short and in keeping with the 60’s/trad. Country songs timing. This album goes by very quickly but it takes you to many places. Guitar nuts will have a field day with this one. Keep your air guitar handy. Desert Prayer, pt. 1: A short chant like intro to the album to get us started on the journey. Mojave: Definitely a track like Marty was talking about, combining that 60’s surfing riff with a western movie soundtrack. A guitar feast. Lost on the Desert: Previously recorded by Johnny Cash, this song is perfect for this album. It has that Marty Robbins/Roger Miller feel. If you follow a map you can go to all of these places in a row. Way out West: The title track and the longest track by a country mile on the album, which seems fitting. Going from Arizona to California now. A storytelling at its finest. A different kind of “trip”. El Fantasma del Toro: This loosely translates to The Ghost Bull, according to Google! Unmistakably Mexican, with Spanish Guitar and with some 60’s twang. Old Mexico: As the title suggests, it has that Mexican feel, and very Marty Robbins like. Time Don’t Wait: Has a Travelling Wilburys feel. Great beat. One of my favourites on the album. Quicksand: Sounds like a shootout at 12 paces. Again with the 60’s guitar twang. Watch the guy up on the balcony and the terrain in front of you. Air Mail Special: As mentioned earlier, this sounds like Elvis crossed with Rockabilly and it gives you a geography lesson at the same time. I think that you travel just about every mode of transport on this album. Torpedo: This has been a highly promoted song and with good reason. It definitely takes us to the coast and to the 60’s. Guitars and drums on this are perfection. Please Don’t Say Goodbye: You have to have a leaving song on a country album or it isn’t a country album. More Gerry and the Pacemakers feel to this one than 60’s surf music. Whole Lotta Highway (with a million miles to go): One of my favourites, we’re in a truck now! This one will be a crowd favourite. Has a bit of The Byrds sound to it. Desert Prayer, pt II – The first part was more an ode to the native Americans, this one is more of a cowboy ode. Wait for the morning: A sombre, easy listening track which definitely has the feel of heading towards sunrise. You can feel the album winding down. Way Out West (Reprise): End of the Western and the Cowboys disappear into the hills and plains. The word these days is fusion. There is definitely a fusion of styles here and there are some interesting experiments. Marty has often been on middle ground. He is seldom put up with Cash, Nelson, Kristofferson, Jones, Haggard and co, but he is way above the young pack of country musos. He is held in high regard but he is in a position to do what he wants to do without being judged too harshly. He is constant and unwavering. This is a treasure for not just country music fans but for all fans of great music. The fact that 60’s music and country music are my two favourite styles makes this fan a very happy camper. This is a rippa. A few years ago, I saw Matt Henry as a support act to Shane Nicholson. As I bought the Itunes version (a measure of my impatience), I didn’t know any of the credits, but as I listened, I thought, this has the Shaneo touch. When I looked for reviews to find out information, I found out that Shane produced it. I am getting addicted to albums with the Shane Nicholson touch. It would also explain why we don’t get to see many Shane Nicholson albums, he is too busy producing other people’s stuff. This album is so much better than even the little titbits that Matt played at that first introduction. I have played this album over and over and I am so impressed. Sometimes the most loveliest gifts of life are the things that you don’t expect. Along with The April Family and Michael Waugh, this, so far, is my best surprise this year. I had a big day on the launch day in Tamworth. I had fully intended to make this Alt. Country late night at Tamworth Servies, but the gig that was on beforehand ate into the time…..it was my birthday after all! There is a bit of wit and tongue in cheek overtones to more serious moments and highly infectious tunes. The lyrics are intriguing one minute and oh so clever the next. Matt’s voice has a beautiful timbre to it. This is a very polished and engaging album. Rhinestone Climb: This is a catchy song with an equally catchy tune. A toe tapper with a darker side. The Best That They Could Do: A gently rocking song with some fabulous lyrics. I went to quote one line and then the next line was even better. One of the best on the album if not THE best. Trying to Pretend: My kind of song. I love it. It is a bit cheeky, a bit sad and the melody is fantastic. I almost feel like I am on a train. There’s a bit of Dylanesque harmonica in there too! Catch Someday: A real singalong song, a definite Shower Song contender for the Kazzie Awards in December. Some great fiddle and lots of cool strumming. A very familiar voice is featured on this song….see if you can pick it….hint, she won a Golden Guitar this year. You and I: I read a brief interview and it said that this was one of Matt’s favourites on the album. It is one of mine too. Garden of Needs – destined to become a shower song for me. Very catchy…wo oh wo oh. Two shower songs on one album…I think that is a record….pun intended. Something about this song reminds me of George Harrison. That has to be a good thing, hey? 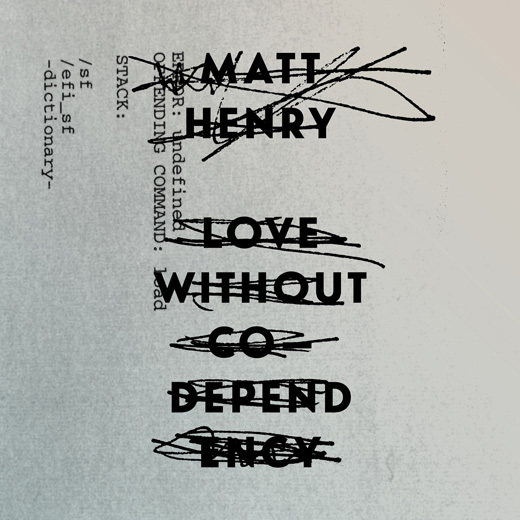 Love without co-dependency: The title track and one that Matt said that he was particularly proud of in that abovementioned interview. There are some clever lyrics. Little Dead Bird: At that gig that I mentioned before, Matt sang this song. This is one of the few of his songs that sound anything like this. Friendly warning to any bird lovers and vegans. I died on a beautiful day: One of those onion songs…it has many layers. I have listened to this song about 10 times and get about 10 different meanings to it. It is equally beautiful and sad. Way back home: This album is a journey and so is this song. 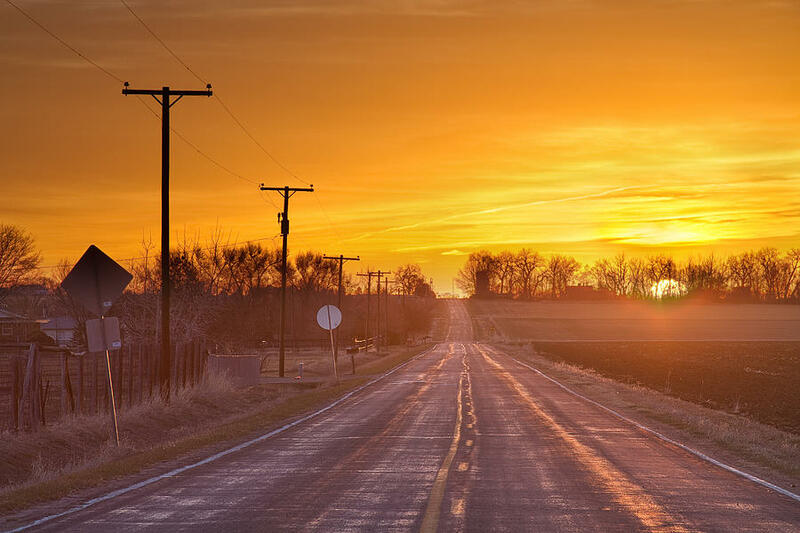 You really feel that you are on a road somewhere or an oft travelled path. Half moon bay: Lachlan Bryanesque piano feel, with some great lyrics and a tune that carries you away. The images that this song conjures up are very clear. This album delivered on many fronts.